ART OF TRANSIT: You don’t see too many AMC Pacers around anymore; the car debuted in 1975 and was popular for a few years. I saw this one parked on a local street with an ad in the window offering it for film shoots. Smart! I took the photo with my iPhone and used Snapseed’s Retrolux feature to make it look like something shot on cheap film in the 1970s. A test spin on the new portion of the 7th Street bike lane in DTLA. 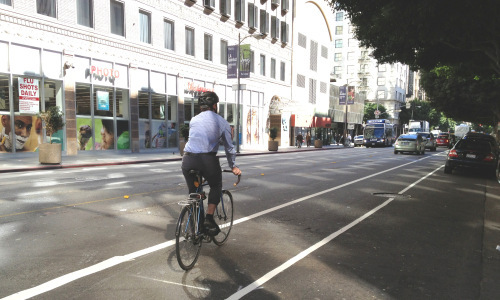 Photo: LADOT Bike Blog. The new bike lanes on busy 7th Street in downtown Los Angeles between Figueroa and Main street have been painted and signage is going up. I’m guessing the new lanes will be useful for cyclists coming and going from the busy 7th/Metro Center station that serves the Red, Purple, Blue and Expo lines. Not really related: Brooke Shields dressed as a New York CitiBike for Halloween. At a community meeting last night, Los Angeles Councilman Jose Huizar and streetcar officials said that recent city cost estimates were a worst case scenario and better numbers should be available by year’s end. They said the cost of the streetcar line would likely be between $153 million and $162 million — more than the $125 million originally touted and less than the $300 million number used by the city if utility relocations are extensive. As we’ve mentioned here before, this project will live-or-die depending on how much money the federal government is willing to spend. Promoting “preparedness” is doubtless a good idea. As the executive order notes, climate impacts—which include, but are not limited to, heat waves, heavier downpours, and an increase in the number and intensity of wildfires—are “already affecting communities, natural resources, ecosystems, economies, and public health across the Nation.” However, one of the dangers of this enterprise is that it tends to presuppose, in a Boy Scout-ish sort of way, that “preparedness” is possible. As we merrily roll along, radically altering the planet, we are, as the leaked I.P.C.C. report makes clear, increasingly in danger of committing ourselves to outcomes that will simply overwhelm societies’ ability to adapt. Certainly they will overwhelm the abilities of frogs and trees and birds to adapt. Thus, any genuine “preparedness” strategy must include averting those eventualities for which preparation is impossible. This is not something that the President can do by executive order, but it’s something he ought to be pursuing with every other tool. As Obama himself put it in a speech this past spring, “Those of us in positions of responsibility, we’ll need to be less concerned with the judgment of special interests and well-connected donors, and more concerned with the judgment of posterity. Because you and your children, and your children’s children, will have to live with the consequences of our decisions. For those interested in reducing their carbon footprint, please consider taking transit instead of driving alone or biking or walking. More on that subject is on the Federal Transit Administration’s website, including this document. On The Source: New UCLA study finds Gold Line and Orange Line produce less smog and greenhouse gas emissions in near- and far-term. Related: President Obama on Friday issued an Executive Order on increasing preparations for climate change. As part of that, the President created a new task force that includes Los Angeles Mayor Eric Garcetti and California Gov. Jerry Brown. The 26-member task force will be looking to improve cooperation between the federal government and communities when it comes to preparing for and mitigating against climate change impacts. Wow! I visited the neighborhood in 2009 when it was still emerging and pretty quiet. Looks like it’s getting better and better. The bike lanes look and sound like a good idea. I grew up in Los Angeles riding my bike from Silverlake to Hollywood along Sunset/ Hollywood Blvd’s. On more than one occation drivers of parked auto’s opened their doors into my path which caused a collision, my bike hitting their door. I recall once I fell to the ground and a bus had to stop suddenly to avoid running me over. My point is these bike lanes may cause riders a false sense of safety. All to many drivers of autos open their doors in the path of other vehicles without looking causing major damage to the parked vehicle’s door. Think about the damage to a bike and injury their rider. The car that saved Kenosha! I abhor the ignorance and stereotypes propagated in the Urbane map. This region deserves way more respect. I think it’s that is region is too complex for some people to grasp, and they become horribly lazy and disrespectful about it and just spew garbage. I do applaud the expansion of bike lanes through the city, but still firmly believe that all bike lanes should be protected rather then being positioned between traffic and parked cars. I mountain bike multiple times a week without fear, but do not dare ride my bike on the city streets, I have multiple friends that have been door’d or hit and run while commuting on bikes in the city. If you want to get the mass of the citizenry to chose the bike over the car you need to provide them with adequate protection from the automobile traffic. I just watched an interesting movie last week on urban planning called “The Human Scale” and they had a great line, “Make cities for People not for Cars.” I really feel in our drive for transportation efficiency we have made cities that are inherently inhumane for people. Please think how can we make this city Great for People rather than Automobiles or Transportation Efficiency.